Three of Every Four Oil & Gas Lobbyists Worked for Federal Government | Democracy Now!
. That’s a rate that’s more than double revolving-door standards on Capitol Hill. The oil and gas industry has more than 600 registered lobbyists in Washington, and key hires include eighteen former members of Congress, dozens of former presidential appointees. The lobby’s influence has been on full display in the wake of the BP oil disaster: proposals to enact new restrictions or curb oil use have stalled because of Republican opposition and strong objections from Democrats in oil-producing states. In this segment, we’re going to take a look at oil and coal, specifically mountaintop removal, but first oil. Steve Kretzmann is with us, founder and director of Oil Change International. He’s at the Netroots Nation conference. Welcome, Steve. What about this revolving door? What about the power of these lobbyists? STEVE KRETZMANN: I mean, the oil and gas industry and the coal industry are some of the most powerful lobbies in Washington. What we see is things that don’t make sense. For instance, on June 15th, as 100,000 barrels a day were spilling into the Gulf of Mexico, there was a vote on removing subsidies, handouts to the oil and gas industry. It failed miserably in the Senate. Twenty Democrats, including, you know, climate champions like Senator John Kerry, voted against removing subsidies to the oil and gas industry. Why does this kind of thing continue to happen? Why is it so hard to get good energy legislation through Washington? The influence machine for the oil and gas industry is one of the big reasons, unfortunately. AMY GOODMAN: This is a moment, a window of opportunity, where the country, united — Republican, Democrat, independents, Greens — see the tragedy of our dependence on oil with the BP oil spill. What do you think needs to be done now? STEVE KRETZMANN: Well, I think, in particular, we need to demand that Congress breaks its addiction to dirty energy money. You know, if you go to dirtyenergymoney.com, you can look up how much money your representatives are taking from the oil and gas industry and from the coal industry, as well. STEVE KRETZMANN: That’s right. And you will be able to then write your representatives and demand that they stop taking campaign contributions from the oil and gas industry. There’s a lot of other ways that influence works, as well. Lobbying money, in particular, is — you know, we’ve seen lobbying expenditures from the oil and gas industry, in particular, soar in the last quarter. The American Petroleum Institute nearly doubled their lobbying over the last three months, for obvious reasons. But, you know, this is one way that we can begin to make sure that our representatives represent us and not the dirty energy of the past. AMY GOODMAN: When we were traveling through southern Louisiana through the bayous and the towns so devastated by this oil spill, one of my colleagues bumped into a Nigerian executive for Chevron, who was there in the Gulf. And he was looking around and said this happens, I mean sort of proportionately, in the Niger Delta communities; every day, they live with this. Now, Steve, you have a long history of working in the Niger Delta. STEVE KRETZMANN: Well, it’s been going on for fifty years in Nigeria, right? And so, this kind of ongoing spill, this kind of ongoing discharge, the fouling of the waters, the fouling of the lands there, and the destruction of the way of life for the communities in the Niger Delta. Most of those communities were traditionally dependent upon fishing. They can’t be anymore. And so, you have people driven to desperation who are really trying to eke out a living, because of the destruction wrought by the industry there. 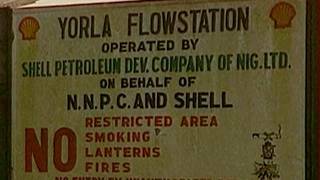 You know, there’s a lot of problems, obviously, in Nigeria, but the oil and gas industry and the discovery of oil by Shell and others in the Delta has really been a problem for those communities, as it is all around the world, unfortunately. It’s not something that — you don’t drill your way to prosperity or development, and that’s an ironclad rule across the board, wherever you are in the world, and it applies, unfortunately, to the Gulf of Mexico as well as it does to the Niger Delta. AMY GOODMAN: You know, it’s interesting. When we see angry businessmen in these southern Louisiana towns, we don’t call them militants, we call them angry, aggrieved businessmen. AMY GOODMAN: What about what we see in the Niger Delta? STEVE KRETZMANN: Well, obviously the Niger Delta — I mean, people have been driven to the point where — you know, where they are taking up arms. And that’s — you know, we don’t endorse violence in any way, shape or form, but you look at the demands behind what a lot of the militants are asking for, and it’s the same demand, for instance, that Ken Saro-Wiwa and the Ogoni were calling for fifteen, twenty years ago, which is a cleanup of their area; it’s, you know, a better share of the revenues, to be able to put it back into community development. But at the end of the day, the most forward-thinking activists in the Delta, and indeed in oil-producing areas all over the place, recognize that the only answer is transition and actually breaking their addiction to the oil economy and building a new clean energy economy. Well, we’re joined also by Bob Kincaid. I met him yesterday at Netroots Nation. He’s an internet broadcaster with HORN — that’s Head On Radio Network, a progressive voice from the Appalachian coalfields. BOB KINCAID: Thank you, Amy. AMY GOODMAN: What’s happening in your community? BOB KINCAID: In Appalachia today, we are attempting to continue to build the momentum and raise awareness, even outside Appalachia, about the devastating impacts of mountaintop removal, not only on our communities, but on the nation at large. We’ve got a mass mobilization scheduled for the 25th to the 27th of September in Washington, DC. It’s called Appalachia Rising. You can go to appalachiarising.org. We’re calling on communities to organize around the — all around the country and come to DC to join with us to demand an end to this toxic, terrifying practice, not just for Appalachia, but for all the people who are impacted by mountaintop removal coal’s pernicious effects. You know, 24,000 people a year die simply because we insist on continuing to burn filthy coal to provide electricity to the nation. We can eliminate mountaintop removal tomorrow, and the lights won’t even dim, because it’s less than five percent of the total electrical energy produced in this country. It’s only done — these communities in my home state and in my home region are only destroyed for profit. It has nothing to do with jobs, because there are less mountaintop removal workers in West Virginia than there are florists, teachers or nurses. It has nothing to do with anything remotely related to the national security or the energy needs of this nation. It is simply done for profit. Very few people working in it, highly mechanized processes, and the sum total is the — has been the destruction of over 500 mountains and 2,000 streams. AMY GOODMAN: Talk about electoral politics now. We just had, in the last weeks, Joe Manchin, the Governor, announcing the successor to Robert Byrd and then announcing that he will actually run for that seat. Explain. BOB KINCAID: This is one of the most sorry examples of kabuki theater politics that this country has lately seen. What Joe Manchin did is to appoint a young man who is a former staffer of his named Carte Goodwin, who is from a highly politically connected family in West Virginia, to fill the seat of Robert Byrd, until such time as Joe can run for it himself and get elected, because for Joe to have appointed himself would have simply been — it would have been so sleazy that the people of West Virginia may very well have rebelled against him. So what Carte Goodwin has been appointed to do is to warm the chair for a couple of months, with the understanding that he will not vote for anything in any way inside the Senate that could be deemed unpleasant for the coal industry. Carte Goodwin is a cipher, if you will, and he is there simply to make sure that coal’s will be done in the Senate. And what it amounts to, what Joe Manchin did, and what I hope people understand, is that Joe Manchin just stuck his thumb in the eye of the entirety of this country, because what Carte Goodwin refuses to vote yea on will have an impact not just on Appalachia, but on every soul in this country, as the poisons from mountaintop removal flow downstream. BOB KINCAID: Ask the families of the twenty-nine miners who died at Upper Big Branch whether coal is adequately regulated, because we’re finding out more and more that that recent tragedy was a function of an outlaw industry, that even if there are regulations, what there are are routinely ignored. The way that a business like Massey works is as an outlaw industry. They’re scofflaws. And frankly, if anything, the regulation should be made so tight that Don Blankenship can’t sneeze without a mine inspector there with a Kleenex. AMY GOODMAN: —- of HORN, Head On Radio Network. And thanks to Steve Kretzmann, who is the founder and director of Oil Change International.